Perfect palette for highlighting, contouring and can be used for blush. It’ can be layered for more enhancements or perfect for that natural look. I use the lighter colors as a powder to set my liquid concealer and it blends so seamlessly ; it’s definitely worth the money. Brenda Grant has rated on date 04/07/19 as If you had to use only one palette....Perfect palette for highlighting, contouring and can be used for blush. It’ can be layered for more enhancements or perfect for that natural look. I use the lighter colors as a powder to set my liquid concealer and it blends so seamlessly ; it’s definitely worth the money. with 4.5star. Because of my skin tone, most bronzing and contouring products either look muddy or make me look like a low-key Donald Trump try hard. Then, I stumbled on this product. The top two powers can be used to brighten and set face makeup, and the third pan is the most amazing highlighter for an everyday kind of look. It\'s not blinding, but it looks like a natural glow. The three contour shades are amazing, They always look good, and they are so versatile. I could easily use this palette for an event, or I could use it for a laid back everyday sculpt. Annie has rated on date 02/25/19 as This Made Me A Contour Convert For GoodBecause of my skin tone, most bronzing and contouring products either look muddy or make me look like a low-key Donald Trump try hard. Then, I stumbled on this product. The top two powers can be used to brighten and set face makeup, and the third pan is the most amazing highlighter for an everyday kind of look. It\'s not blinding, but it looks like a natural glow. The three contour shades are amazing, They always look good, and they are so versatile. I could easily use this palette for an event, or I could use it for a laid back everyday sculpt. with 4.5star. Because of my skin tone, most bronzing and contouring products either look muddy or make me look like a low-key Donald Trump try hard. Then, I stumbled on this product. The top two powers can be used to brighten and set face makeup, and the third pan is the most amazing highlighter for an everyday kind of look. It's not blinding, but it looks like a natural glow. The three contour shades are amazing, They always look good, and they are so versatile. I could easily use this palette for an event, or I could use it for a laid back everyday sculpt. Ashley Carter has rated on date 02/20/19 as Contour palettelike the packaging. Still deeper shades than i expected with 4.5star. The kit is very pigmented so that means a little goes a long way, which is what I want in a product! The lighter colors work great for undereye coverage too. Landry Chopin has rated on date 02/17/19 as A little goes a long wayThe kit is very pigmented so that means a little goes a long way, which is what I want in a product! The lighter colors work great for undereye coverage too. with 4.5star. Encantada con este producto, lo mejor en calidad y costo! Viviana Galeano has rated on date 02/17/19 as EncantadaEncantada con este producto, lo mejor en calidad y costo! with 4.5star. 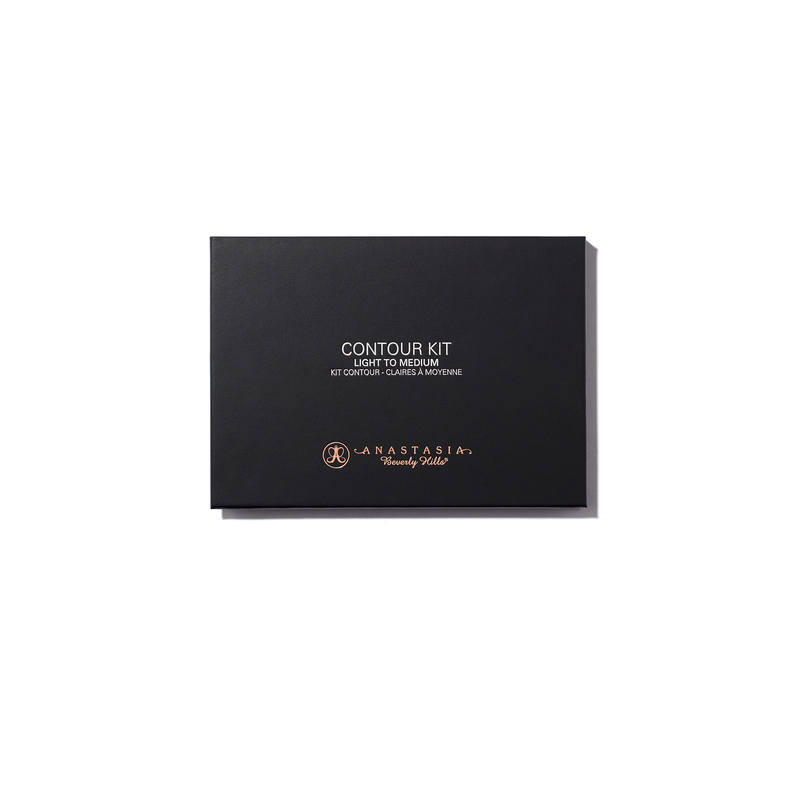 Containing 3 highlighter shades and 3 contour shades with matte and shimmer finishes, Anastasia Beverly Hills’ all-in-one Contour Powder Kit lets you brighten, sculpt and color correct with seamless blendability. Featuring ABH’s innovative pressed formula, each shade effortlessly blends and adheres to the skin, making it easy to accentuate your face, eyes and body. Pair one of Anastasia’s recommended brushes with this product for only $10. Includes A19, A23, A24, and A30. Using A23 Pro Brush, sweep one of the shades from the palette’s top row under the eyes, on the center of the forehead, chin, and down the bridge of the nose to highlight the high points of the face. Next, swatch the three shades from the palette’s bottom row onto the inside of your wrist. Use the shade that best matches your undertone to contour. Using the same brush, sweep the contour shade into the hollows of the cheeks, along the jawline, down the sides of the nose, and around the crown and forehead.